Chicago, IL – September 23, 2015 – Prostate cancer is among the most common cancers in American men, but it can be just as devastating for male dogs, accounting for as much as one percent of all reported malignancies. As the medical community focuses on the devastating disease during Prostate Cancer Awareness Month, PetCure Oncology is taking the lead in providing a revolutionary treatment called Stereotactic Radiosurgery (SRS) that offers new hope for pets diagnosed with cancer. SRS is an advanced form of radiation therapy that is now available to the veterinary community through PetCure Oncology’s rapidly growing national network of treatment centers. Already proven successful in human medicine, SRS offers tremendous benefits by delivering high doses of radiation with sub-millimeter precision in a non-invasive, non-surgical manner. In addition to treating the patient with the intent to cure, SRS requires only 1-5 treatment sessions as opposed to 15-30 with conventional radiation therapy, while minimizing both the risk and the side effects commonly associated with conventional treatment. Pets diagnosed with prostate cancer have historically experienced an average survival rate of just weeks to months. For afflicted pets and their families, this new treatment option may mean the difference between life and death. Dr. Mauldin also notes that most prostate tumors in dogs are locally advanced or have metastasized by the time they are diagnosed, making early detection just as important as in humans. Early symptoms of the disease to be aware of include bloody urine, straining to urinate, and increased urination of small amounts. Weight loss and ribbon shaped stool often appear much later in the disease process, usually after there is systemic spread of the cancer. 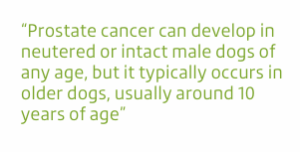 Since the early signs of prostate cancer mimic those of lower urinary tract infection, it can make early diagnosis problematic because many dogs will be treated with repeated courses of antibiotics rather than getting a timely ultrasound or other imaging. Pet owners who notice any of these symptoms in their dog should ask their family veterinarian about a referral to PetCure Oncology for a consultation with a board-certified veterinary cancer specialist. Cancer accounts for nearly 50 percent of all disease-related pet deaths and is the leading cause of death in older dogs and cats. PetCure Oncology is revolutionizing the treatment of cancer in companion animals by establishing veterinary radiosurgery centers across the country. Centers in Phoenix, Cincinnati, and Clifton, NJ are operational. Locations in Wisconsin and Illinois are slated to open in the next few months, with many more in various stages of development across the country. To learn more or obtain a referral to PetCure Oncology, visit PetCureOncology.com or call (773) 850-3400.